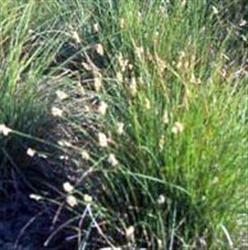 Carex praegracilis is a short, rich green sedge that can be used as an alternative to turf grass, or as an accent plant. It is useful as a transitional plant between high water areas and drought-tolerant areas of the garden. Growing to 6-8 inches tall, this sedge looks like a cheerleaders pom-pom when left natural and with the seed heads in full swing. It will fill in to form a carpet that tolerates moderate foot traffic. A good plant as a solid ground cover, used between and around stepping stones or mixed with bulbs, perennials and grasses to create a natural meadow look. It tolerates full sun to partial shade but has a period of summer dormancy in warmer, drier climates if no supplemental water is given. Moderate water requirements make this plant not quite drought tolerant but certainly lower than most lawn grasses. We estimate that you can cut your water bill to one third compared to regular lawn and still keep that year-round green look. It is hardy to at least 10 F and likely to come back from the underground rhizomes after lower temperatures.